The Yamaha DT-1 is a 250cc, single cylinder, two stroke, reed valve, dual-purpose motorcycle manufactured by Yamaha from 1968 to 1971. 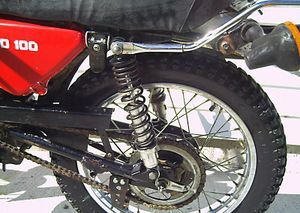 In the United States, two types of off-road machine were in use, one for desert racing, the other for enduros in the north-eastern states. The desert sleds, usually twins, demanded brute power and stability from the machines and strength from the rider to control the weight. 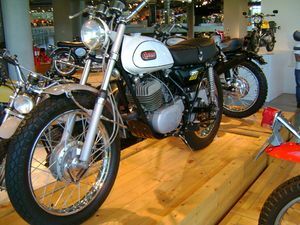 The enduros called for less weight, quick steering and low-down power, so were much as trials models and used a smaller engine, usually a two-stroke single. 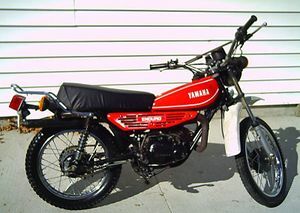 Yamaha saw that there was a major market for a dual-purpose machine, one able to perform well on the road but equally able to run off-road for fun or in competition. Thus came the trail machine, which was able to compete in enduros or simply take its owner up to the hills for the view. 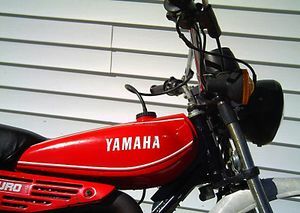 Small, light and handy, it could go many places without tiring the rider and Yamaha's first was the DT1 of 1968, powered by a 246cc two-stroke single driving a five-speed gearbox. It was the start of a long, and most successful, off-road line. The DT-1 made a huge impact on motorcycling in the US because it was truly dirt worthy. 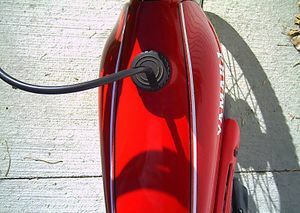 Light, simple, inexpensive, and importantly, supremely reliable, the DT-1 sold by the thousands. 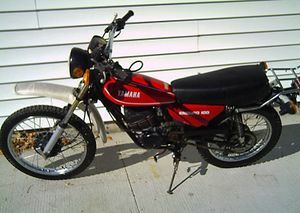 This machine introduced more people t o off-road and fun riding than any other. 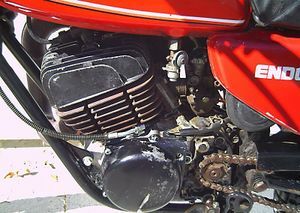 For the racer, Yamaha offered a GYT kit (Genuine Yamaha Tuning) that increased engine power to 30 bhp. Individual companies offered a staggering array of accessories, so its rare to find a stock version today. The Enduro put Yamaha On/Off-Road motorcycles on the map in the US. This page was last edited on 30 November 2010, at 16:38.